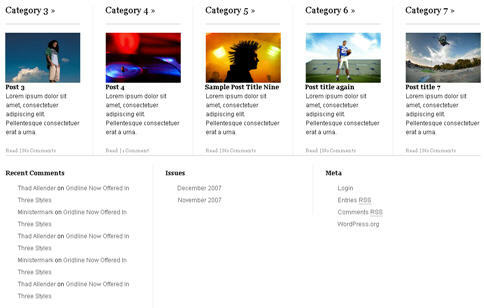 Gridline News is a clean and modular news magazine theme for WordPress 2.3+ that makes use of AJAX on the home page to show off and use cool web 2.0 technology. The main story section contains four of your latest posts layered on top of each other, accessible via tabbed jquery navigation. Gridline News can transform your blog into a full news magazine website and at a very affordable price. Most premium WordPress themes cost $100 but the great thing about the Gridline series is the low price point. You can purchase this theme (or one of the others available in the Gridline set) starting at $24.95! Here’s a snapshot of the footer which I really like. The example photos used in the theme are very colorful and make it stand out. Personal Use License ($24.99) – This package is for someone who intends on using this theme on a single website. This is the full version and includes all scripts, theme files, and images. The credit link is not required to stay in tact. Developer’s License ($99.99) – This package is for developers who intend on using this theme on multiple websites. This is the full version and includes all scripts, theme files, and images. The credit link is not required to stay in tact. Buyout Rights (Contact for price) – Most premium themes don’t offer exclusive rights so this is a great option if you don’t want another site on the world wide web to look like yours. Buy the full rights to Gridline News and it will no longer be available for purchase on our website. This is one of a great set of the Gridline premium WordPress theme series designed by Thad Allender. the pay button isn’t work, how cold I buy this template. ?